Major Uncanny Magazine Staff Changes! This is one of those hard news/good news posts, Space Unicorns. The hard news is that after five years, Managing and Nonfiction Editor Michi Trota has decided to move on from her Uncanny editorial duties at the end of 2019. We can’t overstate how important Michi has been to Uncanny. Michi started with us on day one as Managing Editor. She developed a ton of our processes, made everything look slick and professional, always had a strong voice in the nonfiction, and has been the Space Unicorn Ranger Corps’ biggest cheerleader. We really can’t say enough great things about Michi and what she did for making Uncanny what it is today. She’s a dear friend who has stepped up for every challenge. We know that Michi is going to do more fabulous things in the future. Michi will be staying through Uncanny Magazine #31 (November/December 2019) to make sure we have a seamless editorial transition. Michi will also continue to co-host and co-produce the Uncanny TV pilot, which will be premiering later this year. We are sure that even though she will no longer be an Uncanny editor, Michi’s association with Uncanny will continue in many different ways. And now for the good news, Space Unicorns! 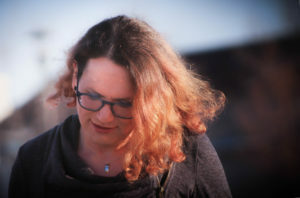 Chimie is the current Uncanny Magazine Assistant Editor, and started with us as an intern in February 2018. She has done a phenomenal job, and we expect more tremendous things from her. She has been working very closely with Michi for quite some time, so we know this will be a seamless transition. 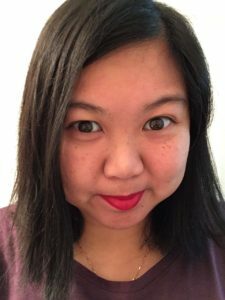 Chimie is a rising superstar writer and editor, and it is such a joy to work with her. We are very excited about this! Chimedum “Chimie” Ohaegbu attends the University of British Columbia in pursuit of hummingbirds and a dual degree in English literature and creative writing. She’s a recipient of both the full 2017 Tan Seagull Scholarship for Young Writers and a 2018 Katherine Brearley Arts Scholarship. She loves tisanes, insect facts but not insects, every single bird and magpies especially, and video game music. 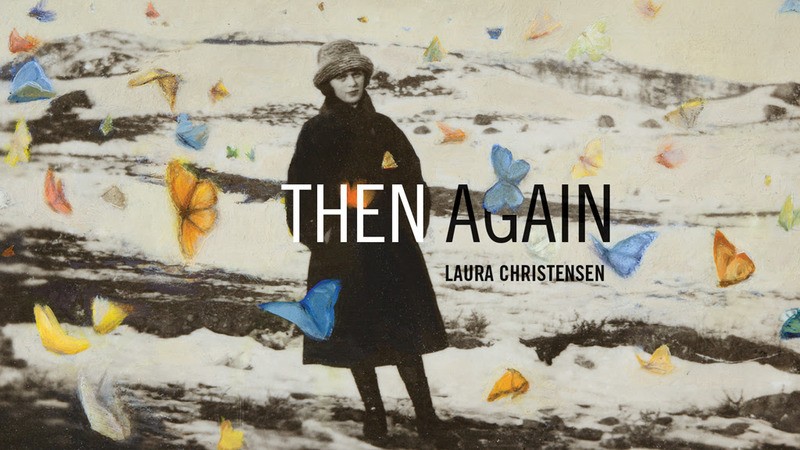 Her fondness of bad puns has miraculously not prevented her work from being published or forthcoming in Strange Horizons, Train: A Poetry Journal, The /tƐmz/ Review, and The Capilano Review. Find her on Twitter @chimedumohaegbu or Instagram @chimedum_ohaegbu. Uncanny readers should be very familiar with Elsa. 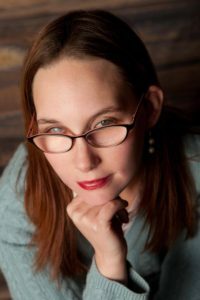 She was the guest Editor-in-Chief (with Dominik Parisien) and Nonfiction Editor of Disabled People Destroy Science Fiction, and has had her essays and fiction published in Uncanny on numerous occasions. We are so thrilled to have Elsa taking over the nonfiction editing. She did a tremendous job as a DPDSF guest editor, and has proven time and time again that along with being a brilliant writer, she is one of the best editors in the business. You might know Angel from her Uncanny Magazine essay. She’s a wonderful writer, reviewer, and editor who has contributed to numerous excellent markets, and we are very excited to have her join the Uncanny team! Angel Cruz is a writer and professional enthusiast, with a deep love for magic realism and Philippine folklore. She is a staff writer at Ms en Scene and Women Write About Comics, and a contributor at Book Riot. She was a 2017 Contributing Writer at The Learned Fangirl, with additional bylines at the Chicago Review of Books and Brooklyn Magazine. Find more of her work at angelcruzwrites.contently.com, or follow her on Twitter @angelcwrites. 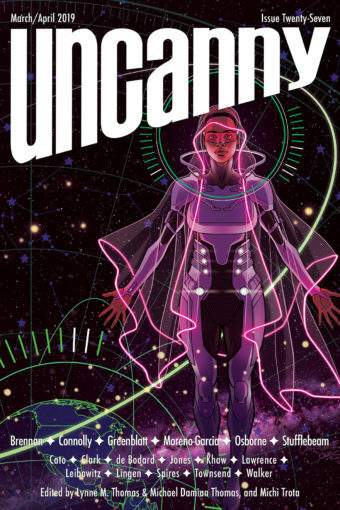 Uncanny Magazine Year 6 will be fantastic, Space Unicorns. Though many changes are happening, we will continue to have the BEST STAFF in the universe. 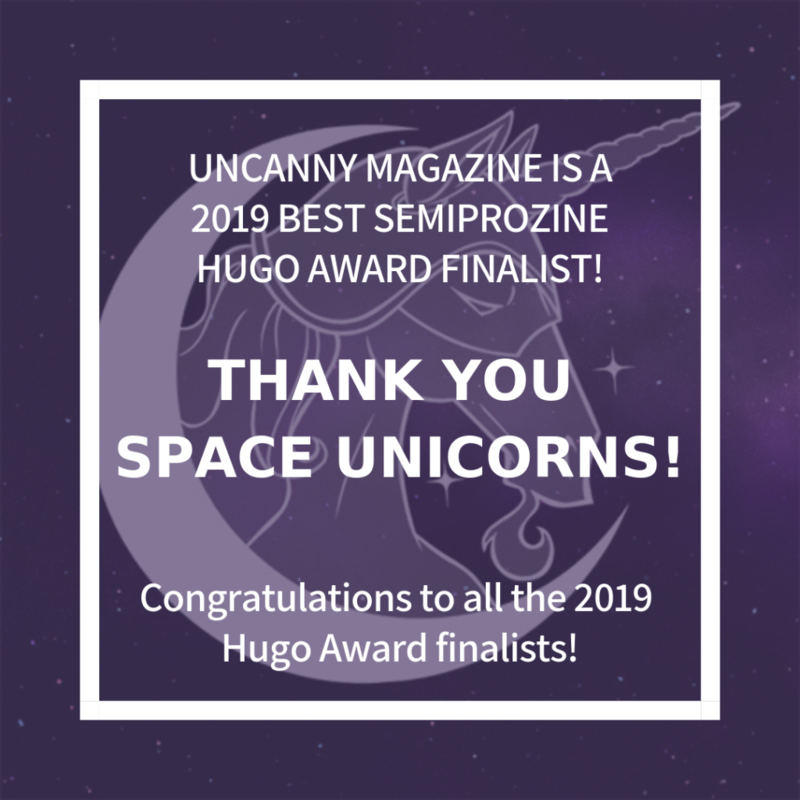 Three Uncanny Stories, the Thomases, and Uncanny Magazine Are All Hugo Award Finalists! PHENOMENAL news, Space Unicorns! Three Uncanny Magazine stories are finalists for the prestigious Hugo Award! “The Thing About Ghost Stories” by Naomi Kritzer is a finalist for Best Novelette, “The Rose MacGregor Drinking and Admiration Society” by T. Kingfisher is a finalist for Best Short Story, and “The Tale of the Three Beautiful Raptor Sisters, and the Prince Who Was Made of Meat” by Brooke Bolander is a finalist for Best Short Story! Congratulations to everybody! Even more wonderful news! Uncanny Magazine (Publishers/Editors-in-Chief Lynne M. Thomas and Michael Damian Thomas, Managing Editor Michi Trota, Podcast Producers Erika Ensign and Steven Schapansky, Disabled People Destroy Science Fiction Special Issue Editors-in-Chief Elsa Sjunneson-Henry and Dominik Parisien) is also once again a finalist for Best Semiprozine! Another fantastic thing! Lynne M. Thomas and Michael Damian Thomas are finalists for the Best Editor- Short Form Hugo Award! Finally, many of our current staff and former staff are finalists for different Hugo Awards! 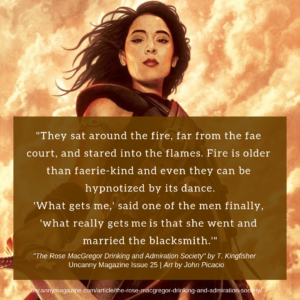 Former Poetry and Reprint Editor Julia Rios and Disabled People Destroy Science Fiction Co-Editor-in-Chief Elsa Sjunneson-Henry’s Fireside Magazine is a finalist for Best Semiprozine! 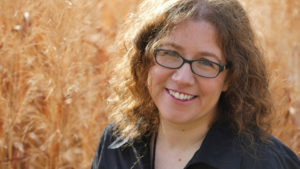 Julia Rios is also a finalist for Best Editor- Short Form and for Best Related work as part of www.mexicanxinitiative.com: The Mexicanx Initiative Experience at Worldcon 76, and Elsa Sjunneson-Henry is a finalist for Best Fan Writer! It is an amazing list of Hugo Award finalists, many of whom are Uncanny authors and friends. CONGRATULATIONS TO EVERYBODY!!! Thank you to everyone who nominated these works. We are honored, ecstatic, and overwhelmed. The finalists for the 2019 Hugo Awards, John W. Campbell Award for Best New Writer, the World Science Fiction Society (WSFS) Award for Best Young Adult Book, and the 1944 Retrospective Hugo Awards were announced 2 April in a live webcast. The Hugo Awards are the premier award in the science fiction genre, honouring science fiction literature and media as well as the genre’s fans. The Awards were first presented at the 1953 World Science Fiction Convention in Philadelphia (Philcon II), and they have continued to honour science fiction and fantasy notables for more than 60 years. Dublin 2019 – An Irish Worldcon will take place in and around the Convention Centre Dublin from 15 to 19 August. More than 5600 people have already signed up as members, including more than 4580 attending members. Only Dublin 2019 members will be able to vote on the final ballot and choose the winners. The 1944 Retro Hugo Awards will be presented on Thursday, 15 August, the opening night of Dublin 2019, and the 2019 Hugo Awards, and the Lodestar and Campbell Awards, will be presented on Sunday, 18 August as part of the main Hugo Awards ceremony. “World Science Fiction Society,” “WSFS,” “World Science Fiction Convention,” “Worldcon,” “NASFiC,” “Hugo Award,” the Hugo Award Logo, and the distinctive design of the Hugo Award Trophy Rocket are service marks of the World Science Fiction Society, an unincorporated literary society. 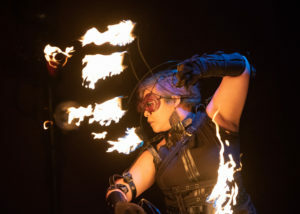 The World Science Fiction Convention (Worldcon) is a five-day event that has been held annually since 1939, apart from a four-year break during the Second World War. The Disabled People Destroy Science Fiction Kickstarter Campaign Wins the 2017 D Franklin Defying Doomsday Award! The D Franklin Defying Doomsday award was judged by Twelfth Planet Press publisher, Alisa Krasnostein, and Defying Doomsday editors, Tsana Dolichva and Holly Kench, and was made possible by our wonderful Pozible Patron of Diversity, D Franklin. The award grants one winner per year a cash prize of $200 in recognition of their work in disability advocacy in SFF literature. Eligible works included non-fiction or related media exploring the subject of disability in SFF literature, published in 2017. It is the campaign promoting the Kickstarter for Disabled People Destroy Science Fiction that was nominated and chosen as the winner of The D Franklin Defying Doomsday award for 2017. Throughout the period of the campaign the team at Uncanny Magazine published essays as daily updates. We appreciate the fact that these were public essays, and hence not limited in access to backers. There was much insight to be gained from reading the personal thoughts of writers with disabilities on their own broad and varied experiences in, and encounters with, science fiction. We are very impressed by the work of the team at Uncanny Magazine and are so pleased to have the opportunity to recognise them with this award, with particular recognition going to guest Nonfiction Editor/DPDSF Co-Editor-in-Chief Elsa Sjunneson-Henry and guest DPDSF Personal Essay Editor Nicolette Barischoff. Congratulations to Elsa and Nicolette and the rest of the Kickstarter team, and thank you to all of the writers, editors, readers, and Kickstarter backers who made the Disabled People Destroy Science Fiction Kickstarter campaign so successful! In the title story of my new collection, Sooner or Later Everything Falls Into the Sea, a character answers questions from a fictionalized music documentary series, Inside the Music. For this blog post, I thought I’d talk about the music in a few of the collection’s stories. This isn’t a music story as such, but I had a great time coming up with the songs that are Easter eggs within the narrative. If you write a few hundred close universes to your own, how can you not imagine the songs that don’t exist here but could have? David Bowie and Sharon Jones were both still alive in this timeline when I wrote the story, so I had every reason to believe I could conjure up a reason for the two of them to collaborate on a new version of Bowie’s “Modern Love.” “Modern Love” itself was Bowie’s take on soul and Sharon Jones. Here’s her “Stranger to My Happiness” – now just imagine her singing lead on “Modern Love,” and Bowie coming in with the backing vocals. You can hear it, right? Me too. I also know exactly how the John-Lennon-who-lived sounds on his 90s song “Change Your Tune.” World-weary, cynical, with a touch of humor. Maybe these tunes bled through the walls between universes, because they exist in my head. The music in this story is all sea chanteys, which was a fun bit of research. I think the main named song is “Married to a Mermaid,” since I figured I’d use a story with a different bit of mythology made real. Here’s the Smithsonian Folkways recording. Songs like that have a lot in common with prose fantasy, because they ask you to accept as given the premise. In this case, that a young man fell off his boat, past the sharks and whales, and down to a mermaid at the bottom of the sea, like ya do. I think most of the named songs in this story are things Gabby is complaining about, like “My Heart Will Go On.” I tried to think of all the songs somebody would get sick of playing on an endless cruise, the way there’s a whole list of songs you know somebody will request if you’re playing covers in a bar night after night. Gabby is a mix of a few real people. Gail Ann Dorsey is one of my favorite bassists. I’ve seen her with David Bowie, the Indigo Girls, Dar Williams, Ani DiFranco, and a host of others. She has an incredible voice and stage presence, and three solo albums of her own, but she’s most well known as a backing musician. Ditto the great Sara Lee, who has played with the Gang of Four, the B-52s, and numerous others as well as her solo stuff. Neither of them has Gabby’s personality, as far as I know. I’m not going to tell you what the band in this story sounds like. Numerous people came up to me after the story came out and told me what the band sounds like, and every single person had a different sound in their head. I love that! I don’t want to interfere any more than I have to. I did mention a few real bands as references in other places in the story. They walk into a bar where a holographic recording of Bruce Springsteen is playing “She’s the One,” and Luce plays it again later when she has a few minutes to herself. “She’s the One” is a song that can get stuck in my head for days and I don’t mind. There’s a Bo Diddley-pulse that runs through it, sitting behind the slow part and then busting out when the song goes from wanting to exuberant. Luce plays a couple of other songs in that second scene as well. One was Frightwig, a great feminist punk band that played through the 80s and inspired a lot of the Riot Grrrl bands that came after. They got back together a few years ago, and I had the good fortune to see them when they came to Baltimore. In the same line, she mentions the Kathleen Battle School, which I invented, and then disappear fear. Disappear fear is my friend SONiA’s band, in whatever form she wants it to take. They’ve been a full rock band, a solo act, a folk duo. The band is her, and she is the band, no matter what form they take. She’s been one of my inspirations as a musician, and I couldn’t resist throwing her into the story. Luce would definitely be a fan. This story takes place during a middle generation of a generation ship’s journey. The narrator lives her entire life on the ship, but she was born into an old-time music family, and is charged with carrying on those traditions. I was introduced to old-time music by my aunt. I’ve gone with her to a few of her old-time music gatherings, which usually involve a potluck dinner, a dozen fiddles, an upright bass, and an assortment of banjos and guitars. The fiddlers call the shots. I’ve described the experience in the story pretty much directly how it plays out. The first two minutes of the video are the performers setting up the background of the song, namechecking Aaron Copland and Alan Lomax, and talking about the special tuning they use, which is the tuning I chose for “Wind Will Rove.” The slower song gives way to a rave-up just after the five minute mark. “Bonaparte’s Retreat” is a great example of the kind of thing I wanted to invent. Songs called “Bonaparte’s Retreat” were being played on both sides of the Atlantic by the Civil War, though the origins were hazy. At various points, people added lyrics, and a bridge, then others stripped them out again. I know what “Wind Will Rove” sounds like in my head. Maybe someday I’ll let you all hear. SPACE UNICORNS! Would you like a chance to receive a copy of Sarah Pinsker’s collection Sooner or Later Everything Falls Into the Sea, courtesy of Sarah and Small Beer Press? Just leave a comment here (or Tweet with the hashtag #UncannyPinsker) with the name and artist of one favorite song of yours that you would love to see in an SF/F story! (Or no song if it is too hard to choose one!) You have until 11:59 pm Central on Wednesday, March 27! Five of you awesome people will be chosen at random for this phenomenal book! ETA: This is for US residents only. If you answered before this ETA was posted, though, we will still take care of the international shipping if you are randomly chosen. Sarah Pinsker’s short fiction has won the Nebula & Sturgeon Awards, and she’s been a finalist for the Hugo and numerous other awards. 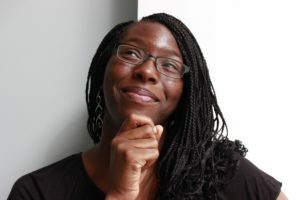 Small Beer Press will publish her first collection, Sooner or Later Everything Falls Into the Sea, in March 2019, and her first novel, A Song For A New Day, will be published by Berkley in September. She’s also a singer/songwriter with three albums on various indie labels and a fourth on the way. She lives with her wife and dog in Baltimore, Maryland. 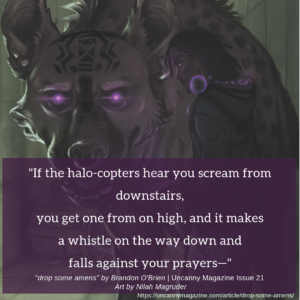 Uncanny Magazine Issue 27 Cover and Table of Contents! Coming March 5, THE TWENTY-SEVENTH ISSUE OF THE 2016, 2017, & 2018 HUGO AWARD-WINNING UNCANNY MAGAZINE!!! The free online content will be released in 2 stages- half on day of release and half on April 2. 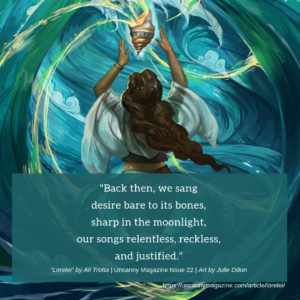 Six Uncanny Magazine Poems Are Rhysling Nominees! Outstanding news, Space Unicorns! 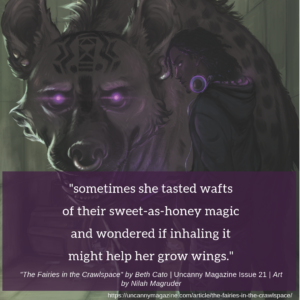 Six Uncanny Magazine poems are nominees for the Science Fiction and Fantasy Poetry Association’s Rhysling Award for speculative poetry! 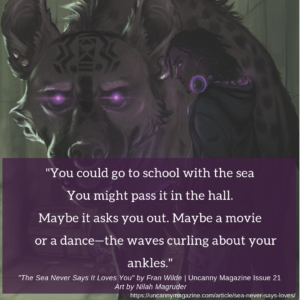 Brandon O’Brien’s “drop some amens,” Betsy Aoki’s “Okuri Inu, or the sending-off dog demon,” and Fran Wilde’s “The Sea Never Says It Loves You” are all nominees for Best Short Poem. 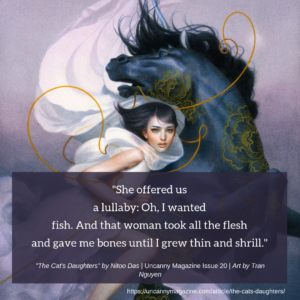 Nitoo Das’s “The Cat’s Daughters,” Beth Cato’s “The Fairies in the Crawlspace,” and Ali Trotta’s “Lorelei” are all nominees for Best Long Poem. Congratulations to Brandon, Betsy, Fran, Nitoo, Beth, Ali, and all of the Rhysling Award nominees! And Yet by A. T. Greenblatt Is a Nebula Award Finalist! Outstanding news, Space Unicorns! 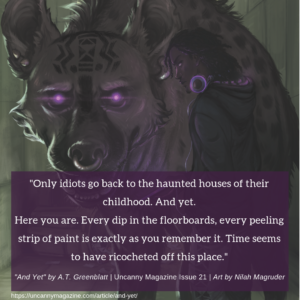 “And Yet” by A. T. Greenblatt is a 2018 finalist for a Best Short Story Nebula Award! It is an amazing list of finalists. CONGRATULATIONS TO EVERYBODY!!! Hello, Space Unicorns! Nominating for the Rhysling Award for speculative poetry is now OPEN! If you’re a SFPA member, you can nominate short and long poetry up until February 15. Uncanny Magazine 2018 Favorite Fiction Reader Poll Results! Space Unicorns! It is time to announce the TOP STORY in our Uncanny Magazine 2018 Favorite Fiction Reader Poll! 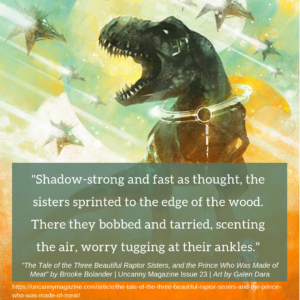 The Tale of the Three Beautiful Raptor Sisters, and the Prince Who Was Made of Meat by Brooke Bolander!!! Congratulations to T (Ursula), Isabel, Naomi, Arkady, and Elizabeth!